On this page, I’ll attempt to describe what’s required to make natural gourds into a bird house for Purple Martins. 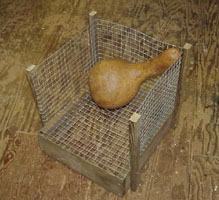 Gourds can also be used to house other cavity nesting birds and the same general criteria will apply. You will need the proper size gourds and entrance holes for that species along with the proper location and height above the ground. For birds other than the Purple Martin, see the birdhouse hole size chart before starting. It’s common knowledge that martins love a large gourd to nest in. It might be the homey feel or the natural look, but whatever it is, they flock to them. Since gourds are their preferred housing, here are a few tips to make them into martin houses. Obviously, you’ll need some gourds. Make sure they’re nice and big, at least 9 inches in diameter and as thick walled as you can get. General shape and looks are your own preference. The birds don’t care about their shape or how many blemishes they have, so you don’t need perfect gourds to make birdhouses. Save the beautiful ones for crafting and painting. * A Crescent Entrance or Adjustable Entrance Cylinder; or you can cut your own crescent directly into the gourd. * A Cleanout Access Cylinder and Lid. * A 3″ and a 4-1/2″ hole saw This will allow you to cut the large round holes needed for the crescent entrance cylinder and the cleanout access cylinder. For other birds, see the hole size chart. * A jigsaw if you don’t have holesaws, or if you want to manually cut the crescent entrance hole. * A drill with a 1/4″ or 5/16″ bit, for drilling the ventilation, hanging and drain holes. * Some Copper Sulfate, used to preserve your gourds. * A large container large enough to hold at least 5 gallons of water. * Some good ;white; latex primer and house paint. Note: Since the introduction of the European Starling into this country, the purple martin has suffered greatly from these fierce nesting competitors. With the advancement of the starling into just about all of the martin’s range, these new starling resistant entrance holes (SREH)’s are a must at any martin site. No, starlings are not a problem everywhere and I’ve heard stories from folks that they have never seen a starling at their martin site. However, for most of the country, this is not so. Starlings have become a very big problem and if this is the case at your site, then I highly recommend that these new styled holes be used. Starlings must be kept out of martin housing at all costs. Round holes are no longer advisable if starlings are present and the responsible housing and plastic gourd manufacturers are changing all their tooling over to crescent shaped holes. Some housing manufacturers still insist on using round holes on their housing, but unfortunately, they are more interested in their bottom lines than the martin’s welfare. 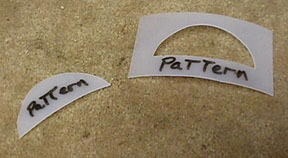 A number of different entrance hole shapes were tested. The crescent was by far the best in keeping starlings out of the housing, and the easiest for the average landlord to make and use. Amish Gourds has made it even easier with the new entrance cylinders. No special tools are required to install them and probably best of all, the martins don’t even hesitate in using them. My entire site has been changed to crescents, and trust me, I stopped having starling problems from the very day I made the change. It’s much easier to make the gourd with the SREH than to change it later. Once the gourd is finally dry, (if you grow your own), it will require cleaning. The outside skin will have the residue on it that was produced during the curing process. This residue will range anywhere from just a light coating, to a thick mold, that looks like the one shown here. Even though the gourd has a lot of this residue on its outer skin, there is nothing wrong with it. It’s natural and simply needs to be cleaned off. The first thing to do is to “cut” the stem. If not already cut in the field at harvest, using a pair of pruning shears, (or sharp utility knife), cut the stem off about 2 inches from the gourd. When adding the entrance hole, I actually make it a point to add the hole directly under the remaining portion of the stem. The martins actually love sitting on these stems, so leaving them a little something to perch on is not all that bad. Never try to “twist” off a stem, they are very stringy and tough. Now for the cleaning. This can be done in a number of different ways. The dust from gourds is very acidic and does have an effect on people that have respiratory problems. It is advisable to wear a respiratory mask so that you don’t breathe in these dust particles, or use an alternative method to sanding. See Working Safely with Gourds. One method of cleaning off the residue is to sand if off. Using about a 100 grit sandpaper (or finer), you can use a palm sander if you have one available and sand off any excess residue. Or you could simply put the sandpaper over a small block of wood and sand away, however, this tires the arms pretty quickly. A small block of Styrofoam also works very well. It’s soft and will conform to fit the curves of the gourds better. Don’t over do it. You don’t want to break through the outer skin. I’ve found a second and third way to clean gourds and both are easier than sanding. The second way is to clean the gourds with a little metal scrubber and a bucket of warm, soapy water. Just about everyone has old 5 gallon buckets laying around and they will work just great for this project if you only have a few gourds to do. If you have more, then a larger container will work better because it’s nice to have a little extra room to work. 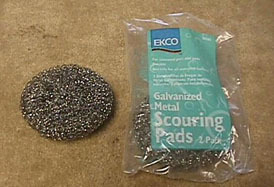 I also get these small hand held metallic scrubbers and scrub the debris off. These can be purchased in just about any grocery store in the kitchen aisle. Let the ‘dirty’ gourds sit outside for a while under a water sprinkler of some sort. A soft rain on them for an hour or two works wonders. No, this will not soften the original gourd in any way, once they are cured, they will stay hard. The water softens the residue on the outside of the gourds and it easily scrubs off with the pad. These pads work great at removing the debris and there’s no gourd dust flying all over the place for those having respiration problems. Simply set the gourd in the pan or bucket of water and start scrubbing away, turning the gourd as you go. If you have a bunch to do, then you might also want to purchase a pair of thick rubber gloves to save on the hands. Clean it as much as you like, then set it aside to dry or simply towel it dry with a paper towel. Don’t try and remove every spot. Some of them are discolorations in the skin and they won’t come out and besides, you’re going to paint the gourd anyway, so they don’t have to be perfect. towards the back of the jig. Again, let the gourds sit for an hour or two under a water sprinkler to soften the debris on the outsides. Then simply place the gourd in the stand and spray away. The gourd often turns around by itself as the spray hits it, so there is seldom any need to turn it manually. Caution: Wear safety glasses and maybe a rain coat. Yes, it can be wet with the occasional spray bounce back, but it’s so easy that it makes it all worthwhile. Plus, if you do it on a warm sunny day, it’s actually refreshing, and kind of fun. This is also a good way to tell if you have quality gourds with good thick walls. If you have gourds that are thin walled, this pressure washing method will sometimes cave them in and THIS IS GOOD, because if a gourd can’t take the force of the washing, then it wasn’t of good enough quality to be a martin gourd in the first place. I wash a lot of them and this has now become my preferred method. 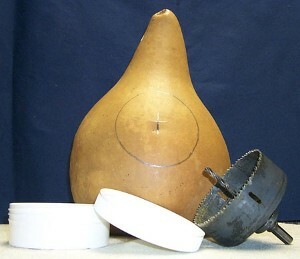 The gourd shown above was washed using this method and so was the one shown in the jig to the right, so you can see the results you get. If none of this sounds like fun, just buy dried and cleaned gourds and save yourself the hassle. 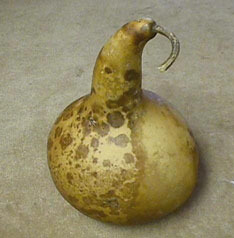 Amish Gourds has inexpensive birdhouse grade cleaned gourds. Go to the Dried and Cleaned Gourds page. Scroll down to Purple Martin House Gourds, or buy a complete Purple Martin Gourd Birdhouse Kit. plastic jugs. In fact, the sides of just about any plastic jug will work such as bleach or laundry detergent. They’re nice and flexible and wrap around the curvature of the round gourd. The following is the procedure for cutting a crescent shaped Starling Resistant Entrance Hole (SREH) into your gourds. (Or any other housing for that matter). The first thing you need to do is establish the equator of the bulb part of the gourd. This is the vertical halfway point on the gourd bulb. Using a straight edge, draw a straight horizontal line. If your gourd has any stem left on it, try to position the hole under the stem. Now, using your SREH pattern, level the bottom of the pattern with the line and then trace the hole pattern onto the gourd. I use a sharp pencil because I want the lines to be as thin as possible. This makes accuracy much easier. Once you’ve finished marking the Entrance Hole, it’s time to mark the Cleanout Access Hole. Draw the access hole opposite of the entrance hole. Trace the 4-1/2″ cleanout hole onto your gourd high enough that it won’t interfere with the nest, and when you do nest checks, you’ll be looking down on the nest and not in from the side. The bottom of the access hole should be about a half inch above the equator. If you want, you can use a compass to mark the hole. 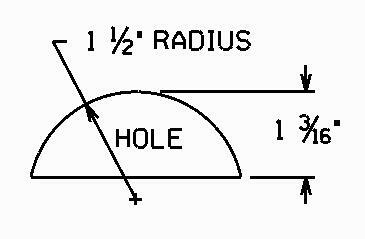 Find the center of the hole and mark it with a pencil. This will be where you start drilling the pilot hole. Now take a moment and check to make sure your hole outlines are where you want them before you do any cutting. You only get to cut it once so you want them located correctly. If you do not have hole saws, drill a large enough hole (5/16″) inside your lines to use as a starting hole for the jigsaw blade. Using your jigsaw with a scroll-cutting blade, carefully cut out the access and entrance holes. Be very careful with the entrance hole. You don’t want to make it too big to begin with because you can’t make it smaller once the material is cut away and the 1-3/16″ is very important in keeping starlings out of your house. I cut INSIDE the lines for the entrance hole so that I’m sure I don’t cut it too big to begin with. I now go back and use my half-round wood rasp and fine tune the hole to make it exactly 1-3/16″. This way, I don’t ruin a perfectly good gourd by accidentally cutting my crescent too big with the jig saw. Once the 1-3/16″ dimension is achieved, I take my drill and using a 5/16″ bit, drill 4 drainage holes in the bottom of the gourd. Many people think it’s a good idea to drill some ventilation holes near the top too, to let some heat out. If you do this, angle them up slightly so water won’t run in. I also drill my hanging hole at this time. 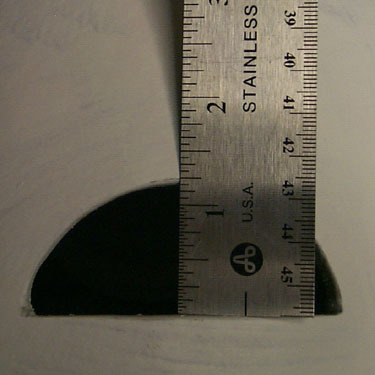 This hole is drilled at the top of the gourd, about 2″ or 3″ down and 90 degrees to the entrance hole. 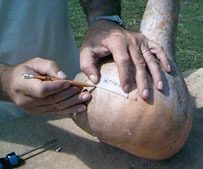 Once the holes are cut, it is now very easy to clean the insides out of the gourd. Simply reach in and pull it all out with your hand until you’ve gotten it as clean as you like. Leave the pith in, so the birds can get good footing. Now is the time to soak your gourds in Copper Sulfate. Simply mix your Copper Sulfate (also known as Root Killer), 1 pound to 5 gal of water in a container large enough to hold a couple of gourds. I use a plastic garbage can. Stir it up good and then submerge the gourds under the water for at least 20 minutes. I use a stick stuck in the hole and a weight tied to the other end of the stick. What this soaking does is kill any bacteria that might begin the rotting process of your gourd and this one action makes them last much longer than if they were not soaked at all. After soaking for at least 20 minutes, drain and then set your gourd aside to fully dry. It will have a greenish tint to it from the sulfate, but don’t worry, it will be all covered up by paint anyway. And no, you don’t have to worry about the green inside, the martins don’t mind at all. Do not rinse them out to get rid of any excess sulfate from the inside. This would be defeating the purpose of soaking them in the first place. Copper Sulfate is not harmful to the birds. Don’t just dump your Copper Sulfate out when you’re done. 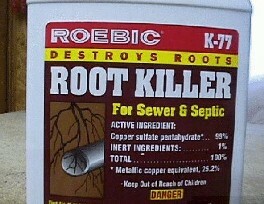 It will kill plants and in fact is used for that purpose in septic systems. If you’re on city sewer systems, then it can be discarded that way. But if you’re out in the country, make sure that where you dispose of it will not harm any plants or get in any water systems. I actually leave the top off my garbage can and let the water evaporate. The Copper Sulfate simply re-crystallizes for use at a later time simply by adding water. After the gourds have properly dried, you can add your cleanout access and entrance cylinders. If you’re using an entrance with a standard SREH from Amish Gourds, you will have already drilled or cut a 3″ hole in the front of the gourd, and a 4-1/2″ hole in the back (4-1/2″ front and back if your using an adjustable entrance). Now you can position the entrance in the front hole. Place it so that the inside of the tube is flush with inside of the gourd. (If you are planning on using the porch decks, make sure the side with the most porch exposed is to the outside). Turn the gourd around and follow the same procedure with the cleanout access cylinder. Note: When installing this, it’s best to leave the cap on the cylinder so it doesn’t get distorted when glueing it in the gourd. Using adhesive caulk, run a bead around the edges. Then, wet your finger and run it around the bead for a nice smooth finish. Make sure to keep your finger wet. 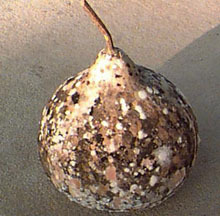 The gourd can then be set aside to dry for 24 hours or more. 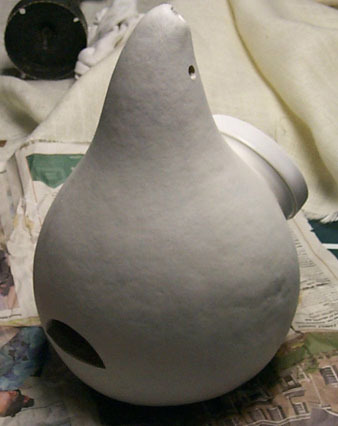 The result is the gourd you see here, ready for painting. Now all that’s left is to give the gourds a good coating of Latex primer and then a coat or two of white latex house paint. I paint mine and then hang them on a rack to dry. If you are an oil based paint fan, then fine, use that. But make sure the primer coat is fully dry before adding your two coats of oil based white exterior paint. A lot of work, maybe. But then, this is supposed to be a hobby and is something that can be enjoyed all year long. There’s no reason to only enjoy the martins when they are here. Working on their housing while they are gone helps keep the interest in the hobby and building our anticipation of their return and of course, that’s what it’s all about. And in the spring, when you first pull that rack up with all these beautiful white gourds, the martins will have a hard time resisting at least investigating them. And I promise, when the martins do return, they’ll thank you by filling your hard worked gourds with lots of babies for you to enjoy for many years to come. And, if you take them down and clean them out every year and place them some place dry for the winter, they’ll last you for 15 or 20 years if you start with good thick walled gourds. I put mine in large plastic garbage bags and hang them from the upstairs rafters of my shop. Every few years, I give them a new coat of paint and they look just like new all over again. 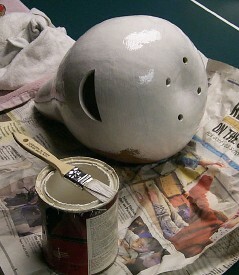 And, since the hard work is already done, I simply bring out my little air compressor and spray paint the gourds. It takes me about 1 minute per gourd and I actually hang them on the racks to dry.